Royal Caribbean has taken delivery of the largest cruise ship in the world from the STX France shipyard. A ceremony was held onboard Symphony of the Seas before she begins service at the end of March. The day has finally come and Royal Caribbean has taken delivery of Symphony of the Seas. This mega-ship isn’t just the newest and largest in the fleet but also the new largest cruise ship in the world. The cruise line and shipyard put on a ceremony to mark the official handing over of the fourth oasis class cruise ship. The delivery event was held at the STX France shipyard in Saint-Nazaire, France and attended by key Royal Caribbean and shipyard personnel. The traditional handover of the flag took place which symbolizes the ship’s official delivery from the shipbuilder to Royal Caribbean. The event wouldn’t be complete by including all the crew members of Symphony of the Seas from onboard and the workers. With the largest cruise ship in the world now delivered, this means that Royal Caribbean will take responsibility for the vessel. The ship is still at the shipyard with the crew preparing for the first voyage with guests on March 31. Symphony of the Seas is actually arriving earlier than expected, she was originally scheduled to begin cruises at the end of April. The ship’s maiden 7-night Mediterranean voyage departs Saturday, April 7 from Barcelona, Spain, where the crescendo of thrills will be brought to life by the 2,200 international crew members who proudly represent 77 countries around the world. 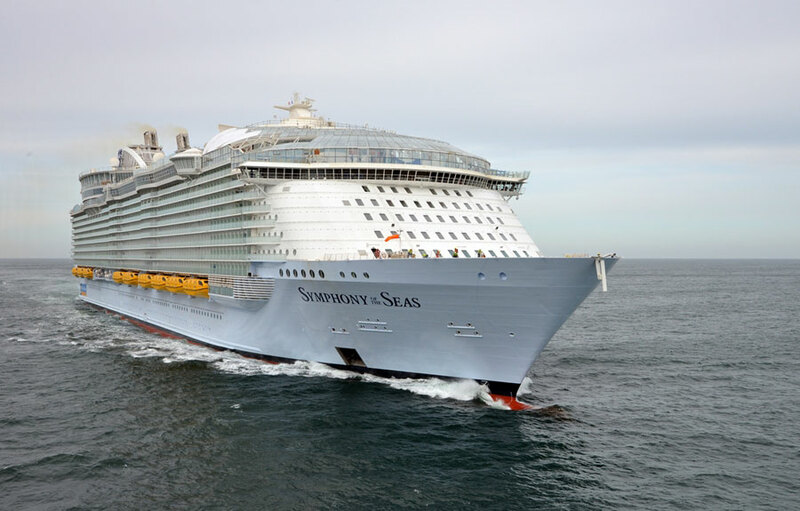 Symphony of the Seas will homeport in Barcelona for the summer, visiting Palma de Mallorca, Spain; Provence, France; and Florence/Pisa, Rome and Naples, Italy. Beginning Nov. 10, Miami, FL. will become the ship’s year-round homeport, making Symphony of the Seas the first new Oasis Class ship to sail from the cruise capital of the world using Royal Caribbean’s new state-of-the-art Terminal A.